reach the green. Good par 4. 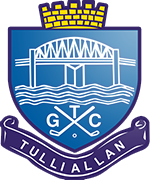 Tulliallan members will receive 10% discount. Monday to Saturday – 0900 a.m. to 1800 p.m.
Sunday – 1000 a.m. to 1700 p.m.